What did you like about the book? 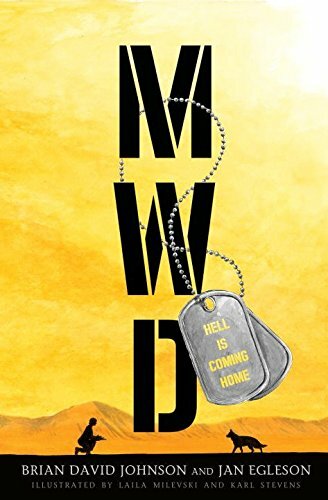 MWD (military working dog) is a moody and moving graphic novel about a young woman veteran of the war in Iraq, returning to her small New Hampshire town. Injured in body and mind, Liz grieves for her faithful dog Ender, her best companion in combat. Her grief comes out in aggressive, self-defeating behavior towards all who try to help her. Flashbacks tell of the roadside bomb that changed her life, and of sexual humiliation at the hands of her male comrades. Her only real affection is for a mercurial stray dog slated to be put down at the local animal shelter. The modest black and white pen and ink drawings reflect Liz’s perceived reality and the economic depression of her surroundings. The text, all narrated or dialogue, is unaffected and sparse. The character-centered story line is an excellent portrayal of the hardship of PTSD. To whom would you recommend this book? I’d recommend this to older teens and adults interested in modern warfare, working dogs in war, and PTSD. Should we (librarians/readers) put this on the top of our “to read” piles? Although I wouldn’t have picked it up, I’m glad I read such a personalized account of a woman soldier and her PTSD upon return. You may also find it compelling. This entry was posted in Book Review and tagged Candlewick Press. Bookmark the permalink.